Competition valve spring design and its relationship to lash. A chief misunderstanding of valve lash is how it correlates to rocker ratio. When you compare a 1.5:1 rocker functioning with lash of 0.015in to a 2.0:1 rocker ratio also with 0.015in lash, they are not the same. Given a common lash of 0.015in., the 2.0:1 rocker begins to move the lifter at 0.0075in compared to the 1.5:1 rocker where valve movement begins at 0.010in. Also, the speed of the ramp is changing. A camshaft designed for 0.015in lash but mistakenly adjusted it to 0.025in, would probably increase the speed of the moving parts by 20 times. As engine speed increases, the valve train components continue to hit harder and harder, which causes them to distort more and more. 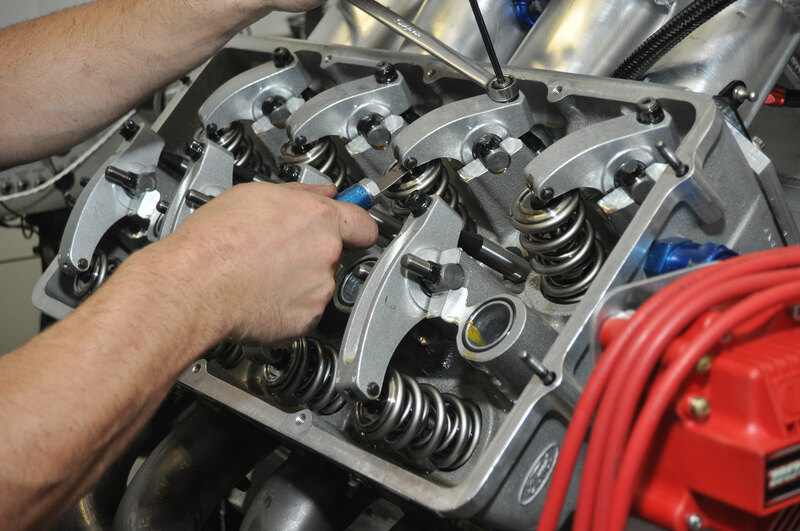 They all bend: the rocker arms bend, the pushrods bend, the fork on the lifter bends, the camshaft winds up. As a result, valve train components are designed to operate at the engine’s highest rpm—this is the point where they cannot sustain further abuse. Another misnomer is the relationship between the crankshaft and the camshaft. Though connected by a chain, the camshaft responds only to the clock on the wall. As engine speeds increase, mechanical activity happens faster in relation to the clock. So, this is why an engine spinning at 8,000rpm can operate with valve lift of 1.200in, whereas an engine turning 10,000rpm is likely limited to around 1 inch of lift. This is because there is only a certain amount of time available to move the valve, and that’s a lot faster in relation to the crank. Joe Hornick has designed successful racing camshafts and valve train for both 903ci Pro Mod engines and NHRA Pro Stock engines. One of his most successful Pro Mod engines operated with 1.440in lift compared to a front-running Pro Stock engine with 1.190in lift. Because the Pro Stock engine revs so much higher, it operates with less lift—although valve speed remains the same. Competition valve spring designers are obliged to move the valve train at its maximum velocity, and the best way to accomplish this is to integrate the spring’s natural frequency with the correct spring rate. Extreme spring pressure provokes excessive deflection in the valve train and when combined with a disregard of the spring’s natural frequency, the valve train doesn’t react well.